At Strawberry Solar, we believe that solar energy goes deeper than providing tax incentives and saving the environment. Our installation project with Cass Community Social Services features how solar can also help create a sustainable way of life for low-income people living in Detroit. CCSS’ mission is to find ways to fight poverty, create opportunities and build community. Since 2016, they have been developing an eco-friendly and affordable Tiny Homes neighborhood in Detroit. In the past year, we partnered with them to create custom solar panel arrays for all 25 homes to help lower monthly energy bills for residents, while also building a greener and cleaner Detroit. 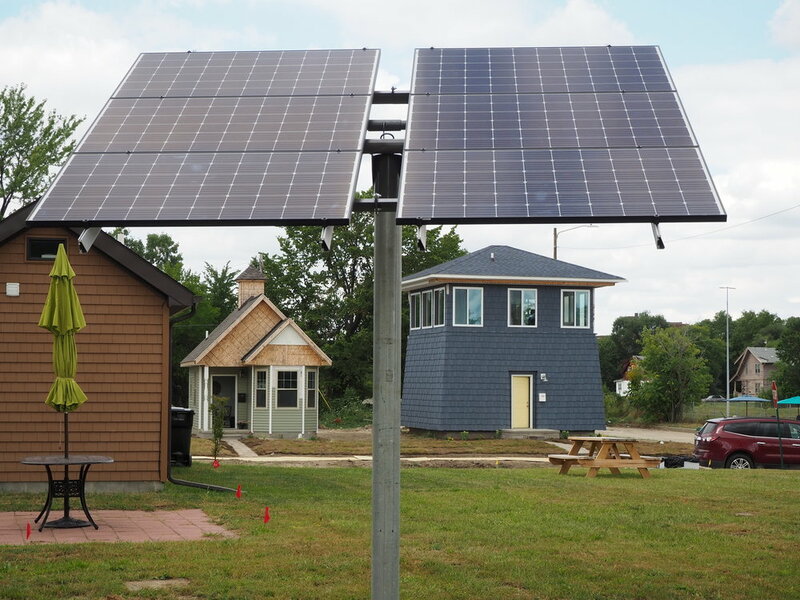 Here’s the lowdown on our Tiny Homes Detroit solar installation. Tiny Homes Detroit residents all qualify as low-income workers who have a combination of experiences including the formerly homeless, senior citizens, college students, and a few Cass staff members. At first, the residents will rent the homes for $350 per month. This means that people making as little as $8,000 a year can rent and own the home and property within seven years. With solar as an added property asset, Tiny Homes will be worth around $40-50 thousand. Tiny Homes and solar combined create significant economic opportunities for long-term residents who become homeowners – they will be able to sell their Tiny Home for a profit or apply for a traditional loan. Strawberry Solar Managing Partner, William Held, prepared pole mounts for the Tiny Homes custom solar arrays. An array is a group of solar panels used to generate electricity. The amount of panels used for an array depends on a home’s energy needs. In addition to saving money for residents, our goal was to save backyard space. And because the unique design of each Tiny Home, a roof installation wasn’t ideal. We decided our best option was to design custom pole mounted arrays that could be positioned several feet off the ground facing south. Solar facing south receives the most sun exposure throughout the day and maximizes electricity production for the home. In each yard, we dug a hole to set the pole for the six-panel array to be mounted to. These pole mounted arrays have been installed for 13 Tiny Homes on Elmhurst Ave., Monterey St. and Richton St. in Detroit so far. We have 12 more installations to go by the end of December 2019. According to Numebo’s cost of living report, the average utility bill in Detroit costs $171.09 per month. That’s about $1,953 per year. Tiny Homes utility bills range from $25-150 per month, depending on electricity use. With the solar arrays we installed, residents will save approximately 20-50 percent off their energy bill, resulting in an estimated savings of $1,053 per year. For traditional homeowners, we have installed solar systems covering up to 100 percent of a family’s utility bill. Customers who purchase their solar system in 2019 can still receive a 30 percent solar tax incentive. Solar tax credits will decrease by 4 percent each year starting in 2020... More solar, more savings. Solar panels use a micro-inverter – a plug-and-play device used in photovoltaics (conversion of sunlight into energy) that converts DC (direct current) generated by a single solar panel into electricity or AC (alternating current) that powers our homes. Each Tiny Home comes equipped with 100 percent electric appliances: stove, washer, dryer, and heat. These appliances are usually powered by non-renewable resources like coal or natural gas. Solar provides a safe and clean alternative energy solution for high energy cost appliances that is more efficient and stabilizes energy rates at a low cost. We founded Strawberry Solar in 2010 to develop turn-key residential and commercial solar installations in Michigan. Our customer service, design, city and utility approvals, installation and remote solar system monitoring production capabilities fulfill our mission: make the world a cleaner, greener, friendlier place. It is our passion to educate our customers on budgets, project timelines, and provide financing options that help make going solar an accessible and comprehensive option. If you’re interested in learning more about solar for your home, request a free quote here. Or, even better, help Cass Community Social Services furnish a Tiny Home. Thank you for reading our Strawberry Solar installation story for community impact.